Why am i getting lag when ooma is behind router?? Re: Why am i getting lag when ooma is behind router?? Here's my test. Hardly a difference. I have 6 pc's, a Wii, and a Playstation 3 on the network. No one has indicated any slowdown. 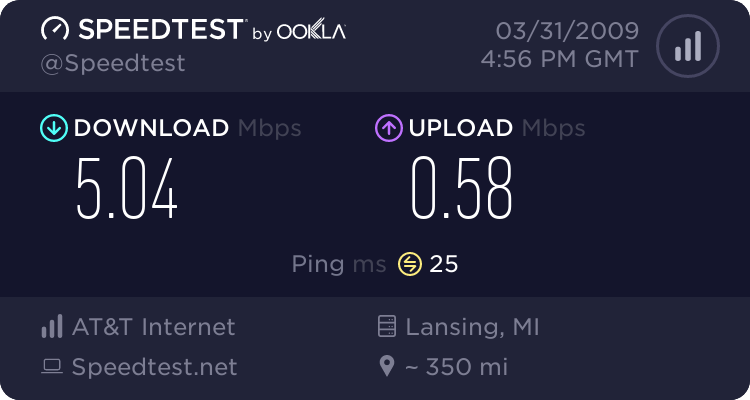 And here's a speed test during an ooma call. hmm so what do you think can be the cause of the problem? do I have a defected ooma device? Oviously something is communicating with ooma. Hopefully someone in this forum can add to this. There are some programs that can monitor your network, my Linksys is running on Tomato firmware which shows a live graph of all outgoing activity and lists in real time what appliance is going where. As a side note: Have you ever tried using Open DNS instead of the dns your cable company gives you? This is a much faster dns than what cable will issue to you and is not controlled by cable. Have you run a VoIP test to see what your packet stream is? What's your jitter and transfer times between servers? I also tried using Open DNS before and it didn't change anything. It sounds to me like the (Linksys) router is causing the lag. I know it SHOULDN'T be the case. But when the Ooma core is up and running, it keeps certain ports open through the router. It's possible the Linksys router is just not handling the traffic properly. You have QoS enabled on the Linksys router. Do you have Ooma as a higher priority than the PC/console for gaming? I suggest you DISABLE QoS completely and see if anything changes. Personally, QoS seems to be nothing but trouble for me and I finally gave up and disabled it. My cable modem speed is so fast that I really don't need to bother with it and I'm typically not running very intense bandwidth hogging apps. QoS is designed to manage traffic within a FIXED bandwidth. But Comcast Cable for example has PowerBoost which gives you temporarily high bit rates. So even a very small amount of traffic trying to exceed the QoS speed setting causes the router to slow down low priority traffic. Another option is to try a different router. The D-Link DIR 615 is not the latest, but it's a good router and down to $40.00. I have the DIR 655 ($99) But it would be better to rule out router before blowing more cash. I would disable QoS completely and see if that makes a difference. Sorry in advance if you tried that and I missed it. thively wrote: My cable modem speed is so fast that I really don't need to bother with it and I'm typically not running very intense bandwidth hogging apps. There is more to data traffic than bandwidth. Maintain a hi-speed connection like 10Mbps actually takes some tweaking to make it work right. It's not like a 56k modem where the pipe is like a straw. Hmm I just tried using a laptop and connected it with an ethernet cable and it didn't seem to lag... which leads me to believe that it might be some settings on my PC that might be in conflict when ooma is plugged in because it doesn't lag when ooma is not plugged into the router.. There was an interesting case that dealt with the person's anti-virus that wasn't allowing them to get to setup.ooma.com. Now, I'm not saying this is the same, but since you mentioned using a different PC and had a different result, it may be worth while to disable any anti-virus or firewall (temporarily) to see if your results vary.